Ayo! launched its latest project Revive the Soil with a special kick-off event in Yerevan. 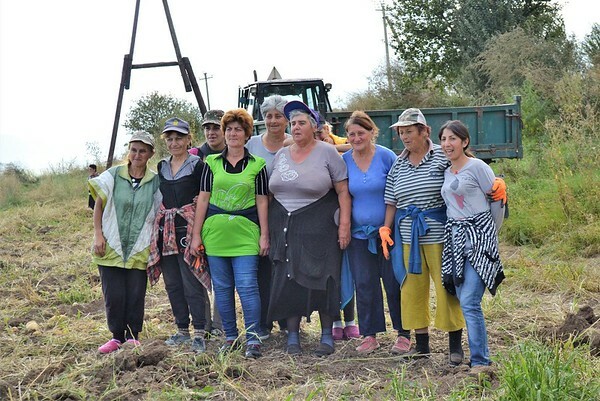 The project aims to raise $25,000 to purchase a new tractor and a grain drill to benefit the 1,490 families (5,967 individuals) of the Lori Berd Region and its nine surrounding communities. Lori Berd is the second poorest region of Armenia. Residents of each community came together for a special food market and bake sale held at Article 3 Human Rights Center in Yerevan. In addition to their yields of potatoes and greens, and homemade products like butter, cheese and honey, they also sold homemade pies, cookies, dumplings and grilled veggies and potatoes. Dozens of people showed up for the event, which raised $250 for the project. “It was amazing. We never imaged so many people would come to the event and that there would be this much interest in us. It is heartwarming to see that people want to help us,” said Arsen Mamajanyan, mayor of Koghes Village. There is much fertile, but uncultivated land in Lori Berd. Uncultivated mainly because most peoples’ insufficient agricultural tools haven’t been replaced since the Soviet era. So, while the soil in this area is very good for growing potatoes and grain, most of it remains untouched. With the proper tools, more people will be able to grow crops for sale and consumption. “Often people face the choice to remain ‘unemployed’ and sit at home with little to do, or to leave their village and their family to search for work in places like Russia. Combatting this type of unemployment will help to mitigate the poverty faced by so many families in this area, ultimately alleviating their despair. It will also further deter people from leaving their homeland in search of a way to survive,” said Ayo! Programs Manager Laura Gevorgyan.